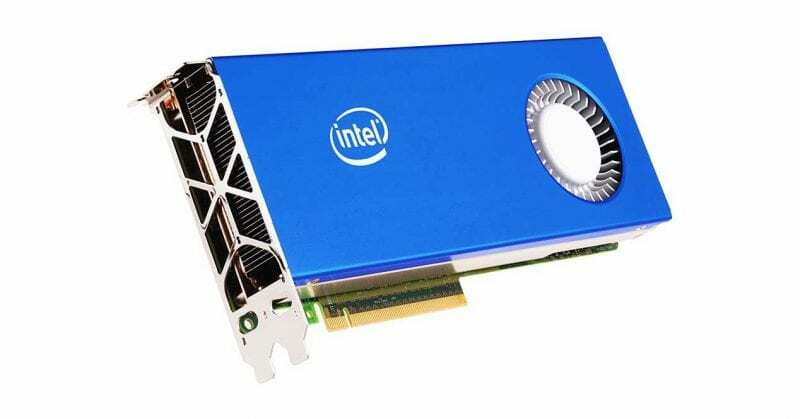 It seems that the giant chip manufacturer Intel is betting heavily on dedicated GPUs simply to become a new manufacturer of dedicated graphics cards. However, now according to the latest reports, the giant chip manufacturer Intel just unveiled its first discrete GPU prototype. The giant chip manufacturer Intel is betting heavily on dedicated GPUs simply to become a new manufacturer of dedicated graphics cards. In November, the company confirmed that it was working on creating its own GPUs, which made sense after the signing of Raja Koduri, former senior vice president of AMD and head of architecture at Radeon Technologies Group. Now, the company has unveiled its first prototype. The company has unveiled the prototype of its first dedicated GPU in 20 years at the ISSCC in San Francisco. This chip is not going to be released in the short term to the market, but it does show that Intel is taking this new path very seriously. The chip is based on the architecture of the integrated graphics cards used by its processors, the latest being the Intel UHD Graphics 630. The manufacturing size is 14 nanometers, with a die of 8×8 mm and 1.5 billion transistors. This figure, to give you an idea, is very close to the 1,800 million transistors of an NVIDIA GT 1030, and exceeds 1,020 million of a GT 730. The GTX 1050 has 3,300 million transistors, while the GTX 1080 Ti reaches 12,000 million transistors. 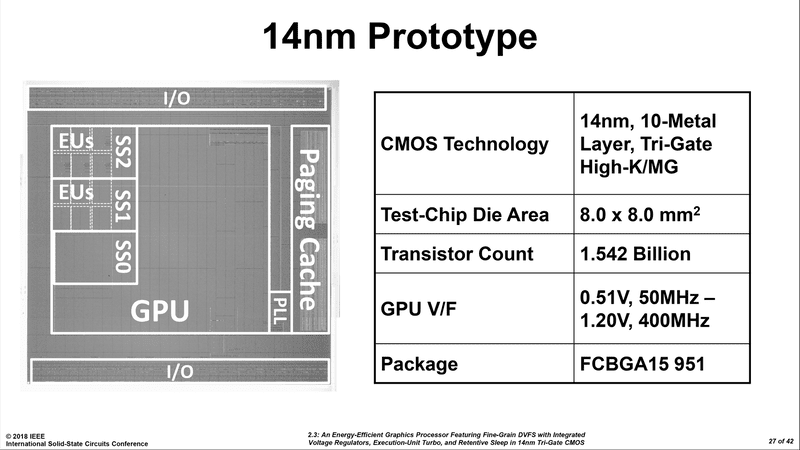 The reason why the number of transistors is so high is because they have a lot of SRAM cache. The frequency varies from 50 MHz to 0.51 volts to 400 MHz to 1.2 volts, a fairly low figure. This chip, as we see, is aimed at low consumption, as confirmed by the company itself. The company wants its chips to be the most efficient, since in the high-end market with the maximum performance it can not compete with NVIDIA, or at least not at the moment. The first step is to make cheap cards, and gradually improve their performance. The first and last dedicated graphics card that Intel launched into the market was the Intel740, back in 1998 with a manufacturing process of 350nm. It was also used as an integrated card in the motherboard. From there, the company only launched graphics cards integrated in motherboards, and later in their processors as we know today. In the year 2000, they had decided to launch a new graphics chip, but they cancelled it. The closest thing to a dedicated graphics card that Intel currently has is the Intel Xeon Phi, which has many small cores to parallelize tasks. These Xeon Phi emerged as a split of Larrabee, which was going to be a graphics card that would be released in 2010. This was finally cancelled due to its low performance. In this conference, the giant chip manufacturer Intel also spoke about the 10-nanometer chips, and how they are going to make cobalt transistors, which allow a smaller size of manufacture and make finer transistors. We’ll see what all this ultimately turns to, but as we see Intel is not idle.